Leather items are one of my favorite things to thrift because buying anything leather is rather expensive. Even at the local craft store they sell 6" by 6" scraps for $5. 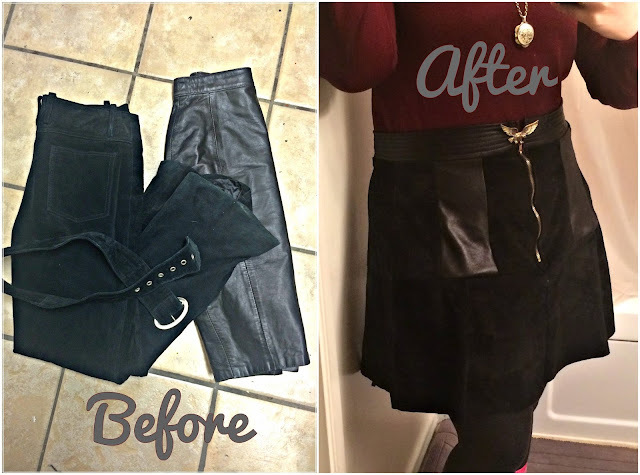 For this refashion I am using a pair of worse for wear suede pants and a way to tight leather skirt. It seems like suede skirt are rather popular recently and I drew inspirations from sources like this. For as much sewing as I have done I have made very few circle skirts which is the look I wanted. Issue was I knew I didn't have enough material to work with to make a half circle, but I needed more than a quarter circle to accommodate my measurements. So after some calculations and guesstimates I came up with a pattern then divided the pattern into the individual segments. Figuring out how to exactly segment out the skirt to work with the suede from the pants was somewhat tricky. There was a decent amount of suede to work with but I didn't want any visible glue lines or previous sewing holes. As you can imagine that eliminates quite a bit of fabric. Done! All in all I am happy with how it turned out. The zipper is a bit puckery, but I am alright with that. I also am not positive how I want to have it fastened. I have several broaches that I think would look particularly interesting. For instance in the photos I have used an eagle pin that I have recently found in a thrift store and a simple belt. The mix of leather and suede is great. And I love the eagle pin!